Have you ever spend a day doing the “Yes Man !” I think I did it for half of the day, and it was … fun! 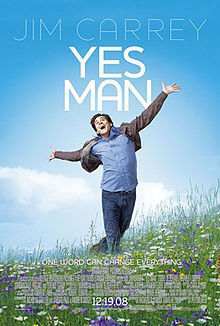 “Yes Man” (2008) is a movie with Jim Carrey where he plays a credit analyst. He decided to change his life by following a personal development program based on a very simple idea: “say yes to everything “. First, I’m little bit shy …being half naked in front of people … no! And last, I had no towel, no lamba ho any, no soap (for shower after) and above all no suitbath ! Naaaaannn, I won’t put a picture !!! lol lol – you have to convince me to go swimming for that ! Carl Allen: You ever had a Red Bull? Ive never had a Red Bull before, but I had a Red Bull last night – I really like Red Bull. Allison: The world’s a playground. You know that when you are a kid, but somewhere along the way everyone forgets it. Carl Allen: What I have to share is huge… and I want to share it with you.